The Chocolate Shop & More! Corporate Gifts, Custom Molding, Boxed Chocolates, Holiday Specials, Fund Raising & More! Put your company name and logo on a box or tin of quality chocolates. 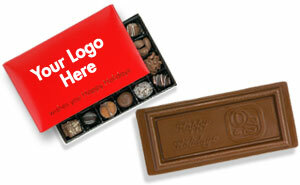 Or put your company name and logo on a chocolate bar. Or have a Custom Molded Chocolate piece made just for your company! The Chocolate Shop & More, located in Buffalo, NY, has been making quality, custom made chocolates since 1950. Our products include corporate gifts, personalized tins and boxed chocolates, custom molded chocolate, holiday chocolate and our spring chocolate catalog fundraising program. Boxed Chocolates  Holiday Specials  Corporate Gifts  Custom Molded Chocolate  Fund Raising and More!